Reducing intake of foods such as apples, pears, and peaches may spell relief for individuals with irritable bowel syndrome and other conditions. Irritable bowel syndrome (IBS), functional diarrhea, and functional abdominal bloating are classified as functional gut disorders (FGDs). These conditions occur as a result of alterations in the function of the intestine and/or nervous system rather than the presence of physical abnormalities in the gut. FGDs are widespread conditions; in fact, IBS impacts about 20% of American adults.1 Although research has linked diet and symptom induction, studies have lacked evidence to support the widespread use of diet alterations for therapeutic benefit in this population. It’s no surprise that living with IBS can greatly impact an individual’s quality of life. Work productivity and physical well-being decline when symptoms appear. Abdominal bloating, present in 82% of those with IBS, is one of the top reasons people seek medical care and utilize antigas medications, often to no avail.3 Professionals should consider a trial of the FODMAPs approach in this population to help manage symptoms. Clients who do not experience improved symptom management should continue to work in close collaboration with a dietitian and a gastroenterologist to rule out other potential dietary triggers or health issues. FODMAPs are prevalent in the diet and are composed of oligosaccharides (fructans, galactans), disaccharides (lactose), monosaccharides (fructose), and polyols (sugar alcohols). Experts have known for some time that lactose can contribute to gas, bloating, and diarrhea in those with hypolactasia. With the advent of sugar-free products, they found that the overuse of sugar alcohols can lead to diarrhea. More recently, they established that fructose can be malabsorbed and mimic symptoms of lactose intolerance. As FODMAPs have a collective impact on GI symptoms, limiting lactose consumption (if a patient defers hydrogen breath testing or testing is not available or if a patient has documented lactose intolerance) with other fermentable short-chain carbohydrates is a good starting point with the FODMAPs approach. Encourage clients to choose low-lactose cheeses, including Swiss, Parmesan, Gouda, Colby, provolone, cheddar, Edam, Muenster, and Monterey Jack. Lactose-free milk and lactose-free cottage cheese are great sources of protein and calcium. Rice milk is another lactose-free alternative, but it contains less protein. Yogurt with live and active cultures may be easier on the intestines but, as a lactose source, should be eliminated initially and reintroduced when symptoms are better controlled to assess tolerance. Individuals should avoid lactose-rich foods such as ice cream, milk, condensed milk, and most soft cheeses (eg, cottage cheese), as they are not FODMAP friendly for those with lactose intolerance. Fructose, most commonly known as fruit sugar, is also found in honey, high-fructose corn syrup (HFCS), agave, sucrose (table sugar) bound to glucose, and fructans. Fructose-containing foods with a 1:1 ratio of fructose to glucose are generally well tolerated on the FODMAPs diet. Conversely, foods with excess fructose compared with glucose, such as apples, pears, and mangoes, will likely trigger abdominal symptoms. Increased use of agave as an alternative to sugar may also contribute to FGD symptoms. Jane Muir, PhD, head of research in the department of medicine at Monash University and one of the prominent researchers in this area, notes, "Agave is high in excess fructose, and therefore we would not recommend it for people with IBS." Fruits that contain excess fructose combined with naturally occurring polyols, such as apples and pears, will likely contribute to more severe symptoms, as the excess fructose and polyols content contributes to the total FODMAP load. Fructose malabsorption is defined as the incomplete absorption of fructose in the small intestine, followed by the delivery of fructose to the distal small bowel and colon, where it contributes to rapid fermentation and resultant abdominal bloating. The absorptive capacity of fructose varies from person to person. Like lactose intolerance, a hydrogen breath test can detect fructose malabsorption. Fructose is absorbed via a low-capacity, carrier-mediated facilitated diffusion GLUT5.6,7 A dietary load of 50 g of fructose produces fructose malabsorption in 80% of healthy subjects.7 Differentiating fructose malabsorption from hereditary fructose intolerance is essential, as fructose intolerance requires total avoidance of fructose. Because HFCS is present in so many foods in the United States, fructose intake is likely at an all-time high. HFCS can be created with various amounts of fructose and glucose but most often contains 55% fructose and 45% glucose distribution. In many cases, individuals can tolerate small amounts of HFCS, as the amount of excess fructose is not great. Encouraging clients to eliminate or limit products made with HFCS, such as soda, barbeque sauce, and cereals, would be a conservative approach to minimizing their fructose load. Inulin and FOS sources of fructans, are added to many foods to enhance their fiber content. Patsy Catsos, MS, RD, author of IBS-Free at Last, notes, "Inulin and FOS are added to foods and supplements precisely because they are fermentable fibers, meant to encourage the growth of friendly gut bacteria. While this makes sense in general, these food additives are sometimes poorly tolerated by people with IBS." Galactans are oligosaccharides containing chains of the sugar galactose. The human body lacks the enzymes to hydrolyze them into digestible components, so they are completely malabsorbed. Consequently, galactans can contribute to gas and GI distress. Dietary sources of galactans include lentils, chickpeas, kidney beans, black-eyed peas, broccoli, and soy-based products. Catsos observes, “Patients frequently experiencing dry mouth as a side effect of medications may chew sugar-free gum or use FODMAPs-sweetened cough drops around the clock to combat dry mouth, only to end up with diarrhea instead." For a quick reference of FODMAP-friendly foods vs. “caution” foods rich in FODMAPs, refer to the “FODMAPs Checklist” table, a good starting point for this dietary approach. Research and the compilation of comprehensive food composition data are ongoing in the area of FODMAPs, and modifications and updates will likely be forthcoming. Helping clients pay close attention to food ingredients can minimize their FODMAPs exposure. Some fiber supplements contain both sorbitol and inulin, making them a “no-go” on this diet. Others contain methylcellulose, a 100%-soluble, nonfermentable fiber, and therefore are FODMAP friendly. Many cough drops contain sugar alcohols or honey, so you should direct clients to lozenges that do not contain these ingredients. Vitamin water containing crystalline fructose is not FODMAP friendly, while many beverages sweetened with aspartame are well tolerated. Chey explains, “It has become clear to me that patients who are severely affected by food-related GI symptoms are already on a highly restricted diet by the time they come to see me. With proper instruction, most of these patients are able to institute the FODMAP [approach] and actually take comfort in having a specific list of foods that they should and should not eat." 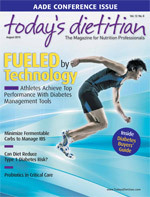 As dietitians, we know that nutritional variety is paramount to a healthful diet. When educating clients, attempt to create a nutritional plan that does not completely eliminate FODMAPs but rather minimizes only those that are problematic. Gibson notes, “The foods that most commonly cause problems are onions (lots of fructans), pasta and bread made with wheat, apples, and pears.” A good food diary and symptom chart will be a helpful tool for you and your client in determining which foods create more GI distress. — Kate Scarlata, RD, LDN, is a private practice nutritionist in Boston. 2. Gibson PR, Shepherd SJ. Evidence-based dietary management of functional gastrointestinal symptoms: The FODMAP approach. J Gastroenterol Hepatol. 2010;25(2):252-258. 3. Ringel Y, Williams RE, Kalilani L, Cook SF. Prevalence, characteristics, and impact of bloating symptoms in patients with irritable bowel syndrome. Clin Gastroenterol Hepatol. 2009;7(1) 68-72. 4. Shepherd SJ, Parker FC, Muir JG, Gibson PR. Dietary triggers of abdominal symptoms in patients with irritable bowel syndrome: Randomized placebo-controlled evidence. Clin Gastroenterol Hepatol. 2008;6(7):765-771. 6. Rumessen JJ, Gudmand-Høyer E. Absorption capacity of fructose in healthy adults. Comparison with sucrose and its constituent monosaccharides. Gut. 1986;27(6):1161-1168. 7. Jiang L, David ES, Espina N, Ferraris RP. GLUT-5 expression in neonatal rats: Crypt-villus location and age-dependent regulation. Am J Physiol Gastrointest Liver Physiol. 2001;281(3):G666-G674. 8. Muir JG, Rose R, Rosella O, et al. Measurement of short-chain carbohydrates in common Australian vegetables and fruits by high-performance liquid chromatography (HPLC). J Agric Food Chem. 2009;57(2):554-565. 9. Moshfegh AJ, Friday JE, Goldman JP, Ahuja JK. Presence of inulin and oligofructose in the diets of Americans. J Nutr. 1999;129(7 Suppl):1407S-1411S. 10. Mäkinen KK. Effect of long-term, peroral administration of sugar alcohols on man. Swed Dent J. 1984;8(3):113-124. * Examine ingredients on gluten-free breads and cereals to ensure other FODMAPs such as honey and agave are not present.